Located in superficial posterior compartment of the leg Soleus is a powerfull lower limb muscle which along with gastronemius and plantaris forms the calf muscle or triceps surae. It runs from back of knee to the ankle and is multipennate. middle 1/3 of the medial border of the tibia, tendinous arch between tibia and fibula. Soleus muslce stabilizes the tibia on the calcaneus limiting forward sway. Gastrocnemius, Plantaris, Tibialis posterior, Peroneus longus and Brevis, FHL and FDL. To act as skeletal muscle: Along with other calf muscle it is powerfull plantarflexor and have major contribution in running,walking and dancing.In the seated calf raise (knees flexed approximately 90º), the gastrocnemius are virtually inactive while the load is borne almost entirely by the soleus. In moderate force, the soleus is preferentially activated in the concentric phase, whereas the gastrocnemius is preferentially activated in the eccentric phase .Human soleus muscle have majority of slow twitch fibers.Human soleus fiber composition is quite variable, containing between 60 and 100% slow fibers.. It is present in 0.7 to 5.5% of humans.It is usually observed during the second or third decade of life and is more commonly seen in females than males at a ratio of 2:1. It is mostly unilateral.. This supernumerary muscle is located under the gastrocnemius muscle, in the posterior upper third of the fibula, in the oblique soleus line, between the fibular head and the posterior part of the tibia. From its origin, the ASM runs anteriorly and medially until it reaches the Achilles tendon. Sometimes it is impossible to precisely identify the ASM origin and insertion, since the MRI fails to show details, depending on the slices.Itmay cause pain on exercise. One may suspect a soft-tissue tumor, such as lipoma, hemangioma, and even sarcoma, but the anomalous muscle has a typical appearance on plain radiographs, and the appearance on computed tomography is diagnostic. If the patient is asymptomatic, no therapy is required, but if pain or other discomfort is provoked by exercise, exploration with fasciotomy or excision of the accessory muscle is recommended, as was done in six of our eleven patients who were seen between 1968 and 1985. Full or partial rupture of the soleus muscle usually occurs when the calf muscle becomes stretched while it is contracting (eccentric contraction). Partial ruptures represent the majority of the ruptures. The rupture occurs in many instances at the point of attachment of the soleus muscle to the Achilles tendon, which will often trigger an inflammation of the Achilles tendon as a result of the soleus rupture. Symptoms: Pain when activating the calf muscle (running and jumping), when applying pressure on the Achilles tendon approx. 4 cm. above the anchor point on the heel bone or higher up in the calf muscle, and when stretching the tendon. Walking on tip-toe will aggravate the pain. Whenever there occurs calf strain and the soleus is the muscle affected then there occur usually the medial or lateral pain i.e along the soleus fibres. And when the pain is in the bulk of the calf muscle then the gastrocnemius is the muscle affected,but, mostly both the muscles are affected together. Another cause of medial pain (posteriomedial aspect of ankle) just above the medial malleous is the soleus syndrome. It occurs because of abnormal sliping of soleus muscle from its normal origin site and is similar to exertional campartment syndrome and commaly seen in dancers and athlets. Respond well to conservative treatment and if not then rarely fasciotomy of the soleus insertion may be required. ↑ A Nardone, C Romanò,M Schieppati.Selective recruitment of high-threshold human motor units during voluntary isotonic lengthening of active muscles.J Physiol. 1989 February; 409: 451–471. ↑ Ariano MA, Armstrong RB, Edgerton VR (January 1973). "Hindlimb muscle fiber populations of five mammals". The Journal of Histochemistry and Cytochemistry 21 (1): 51–5. ↑ Burke RE, Levine DN, Salcman M, Tsairis P (May 1974). "Motor units in cat soleus muscle: physiological, histochemical and morphological characteristics". The Journal of Physiology 238 (3): 503–14. ↑ Sookur PA, Naraghi AM, Bleakney RR, Jalan R, Chan O, White LM. 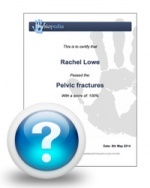 Accessorymuscles: anatomy, symptoms and radiology evaluation. Radiographics. 2008;28(2):481-99. ↑ Crespo E, Minguez MF, Gascó J, Silvestre A, Jolín T, et al. Músculo sóleo accesorio como diagnóstico diferencial de un tumor de partes blandas del tobillo. Acta Ortop Castellano-Manch. 2004;(5):37-41. ↑ Romanus B, Lindahl S, Sterner B. Accessory soleus muscle. A clinical and radiographic presentation of eleven cases. J Bone Joint Surg Am. 1986; 68(5):731-4. ↑ Salomão O, Carvalho Junior AE, Fernandes TD, Romano D, Adachi PP, Sampaio Neto R. Músculo solear acessório: aspectos clínicos e achados cirúrgicos. Rev Bras Ortop. 1994;29(4):251-5. ↑ Leswick DA, Chow V, Stoneham GW. Resident's corner. Can Assoc Radiol J. 2003;54(5):313-5. 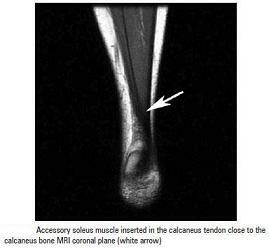 ↑ Featherstone T. MRI diagnosis of accessory soleus muscle strain. Br J Sports Med. 1995;29(4):277-8. 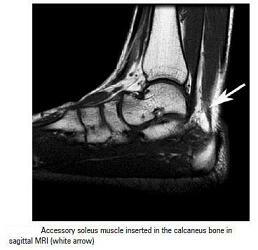 ↑ Doda N, Peh WC, Chawla A. Symptomatic accessory soleus muscle: diagnosis and follow-up on magnetic resonance imaging. Br J Radiol. 2006;79(946):e129-32. ↑ Flavio Belmont Del Nero; Cristiane Regina Ruiz; Roberto Aliaga Junior.The presence of accessory soleous muscle in humans.Einstein (São Paulo) vol.10 no.1 São Paulo Jan./Mar. 2012. ↑ Romanus B, Lindahl S, Stener B.Accessory soleus muscle. A clinical and radiographic presentation of eleven cases.J Bone Joint Surg Am. 1986 Jun;68(5):731-4. ↑ citated from (sportnetdoc.com/foot-achilles/rupture-of-the-soleus-muscle) citated on august 31,2013. ↑ Michael RH, Holder LE: The soleus syndrome. Am J Sports Med 1985; 13:87. ↑ David A.Porter,Lew C.Schow.Baxter's Foot and Ankle in Sports.2nd Edition.Mosby Publication.